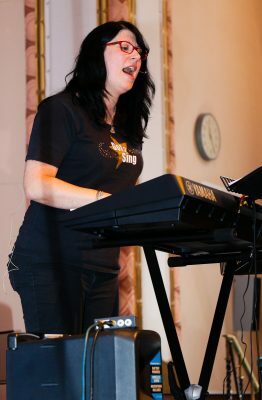 Having sung professionally for more than 18 years, Cathy brings a wealth of performance and teaching experience to Got 2 Sing Choir, together with a wonderful passion for combining great technique with great performance. She began her singing journey at the age of 14, singing solo on the Birmingham Symphony Hall stage with Eric Troyer (ELO)! With a BA Honours degree in Theatre and Performing Arts, and professional training in the field of Contemporary Vocals, Cathy has considerable experience teaching singing and performance skills. Cathy runs a busy private teaching studio in Herefordshire and is also a tutor for The Voice College (an industry-standard training academy online), in addition to the four adult Got 2 Sing choirs she runs weekly. She really does love everything to do with singing! Cathy loves helping people to find their true voice, sing with passion and have a jolly good time expressing themselves.